Validity of a visa is the period that the visa holder is allowed to stay in Vietnam. Your visa takes effectively from the date of issue. Your visa will be automatically expired if you leave Vietnam for your visa is single entry although your date is still has validity. Vietnam embassies and consulates general do not extend the validity of an issued visa. A fresh application is needed after the expiry of the issued visa. Foreigners holding an expired visa seeking entry will be refused. Please make sure that your visa still has validity before entering Vietnam. Make sure the visa is valid before you set off for Vietnam. However, even if a foreigner holds a valid visa, he or she might be refused entering by the immigration authorities. 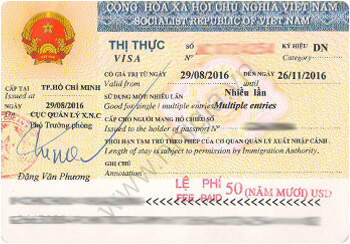 The number of entries of a visa refers to the number of times the visa holder is permitted to enter Vietnam within the visa’s validity. When the entries are all used up, the visa is no longer valid. Even if there are still unused entries, the visa is not valid either if its validity has already expired. In either case, the visa holder should apply for a new visa if another visit to Vietnam is planned. An applicant will be refused entry to Vietnam if all the visa entries have been used up. Duration of stay of a visa refers to the longest period the visa holder is allowed to stay in Vietnam from the day following entry to Vietnam on each visit. After entry into Vietnam, a foreign citizen who needs to stay in Vietnam longer than the duration of stay permitted by the visa must apply for an extension of stay at a local public security bureau before the original permitted period of stay expires. This does not necessarily mean your application for an extension will be approved. Overstaying in Vietnam violates the country’s laws and regulations on control of the entry and exit of foreigners, and could result in a fine or other penalty. Contact us via email: contact@vietnamvisaon.com or at hotline: +84.888.500.500 for more details.